Picky Eater Bento #4! Rainbow Back to School Recipes! Cheesy Scrambled Egg Waffle Recipe – Only 4 Ingredients & A Waffle Iron! Eggs are an awesome vegetarian protein source, with around 6g of protein in an average egg! And, even though scrambled eggs are a classic breakfast, not everyone is a fan—often because of how they look or even the texture. Instead, pull out your waffle maker and try this healthy egg waffle recipe! If you have a picky eater who doesn’t like or won’t try eggs, they might be more open to them in waffle form. This egg waffle recipe is just as nutritious and protein-packed as scrambled eggs, but in a less-mushy form. And, the fun waffled texture can make eggs more enticing! Or, if you’re an egg lover, you definitely have to give this egg waffle recipe a whirl! It’s even simpler than scrambling eggs in a pan, because you can let the waffle maker do the work for you. Serve with ketchup or any tasty dip that you like to make it even more appealing! Whether you’re trying to feed a picky eater or you’re trying to change your own picky preferences, it can be a challenge. But, know that you’re not alone! Both kids and adults can have pickier eating habits—it’s fairly common and very human. And, I get LOTS of request for ideas, recipes, and even meal preps that will appeal to picky eaters. That’s why I created this egg waffle recipe as part of my Picky Eater Bento Box series! Of course, as with all people and taste buds, picky eating preferences vary from person to person. Often, picky eating preferences are more about fears of newness than they are about disliking any particular food. So, to make unfamiliar foods less intimidating, try pairing them with familiar foods. Or, transform them into a more familiar form! As a new food, scrambled eggs may just look like a mushy, unappetizing yellow blob! Instead, this egg waffle recipe takes away the mushiness and makes look like a familiar food: waffles. 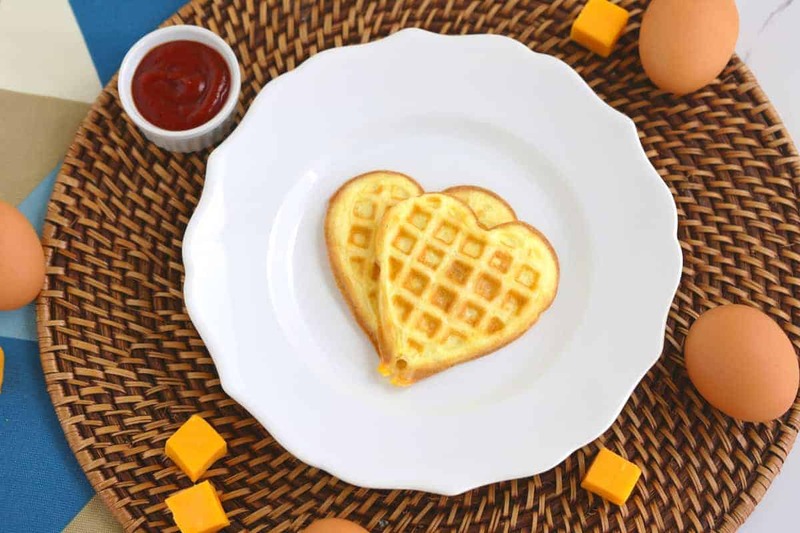 The heart-shaped waffle iron is optional, but it adds a fun change in shape! Most waffle irons should work with this egg waffle recipe. But, if you can use a more shallow iron—with grooves not quite as deep as a Belgian waffle iron—that will work best for this egg waffle recipe! Similarly, research shows pairing new foods with a familiar dip can make a picky eater more open to trying it. A tasty dip can help make the taste of a new food more enjoyable and less scary. And, it’s just plain fun to dip our foods! So, try serving this egg waffle recipe with a familiar and delicious dip! Personally, my go-to with eggs would have to be ketchup. But, there are all kinds of options—guacamole, salsa, hummus, even ranch dressing. Go with what your picky eater likes! In a large measuring cup, whisk all ingredients together. Pour batter into a heated, greased waffle iron, making sure it’s evenly spread across the griddle. Carefully remove from waffle iron, serve, and enjoy! Egg waffle recipe yields 2 servings. *Per serving of egg waffles: 1g net carbs.